1 Preheat hooded BBQ or oven to 200°c. 2 Wash and dry your chicken and place in your roasting pan. Combine Continental Stock Pot, orange zest, soy sauce and 1 teaspoon sugar into a paste and brush over the chicken to coat. 3 Peel the oranges & place rind into chicken cavity. 4 Using a sharp small knife, segment the orange pieces and keep aside for use in the salad. Any remaining juice from the orange can be poured into the cavity as well. 5 Place your chicken in the oven or BBQ and reduce the heat to 180°c and cook for 1 hour, or until cooked (the juices will run clear). Remove & set aside. 6 To make the salad, combine olive oil, vinegar, remaining sugar, mustard and coriander stem to make a dressing. 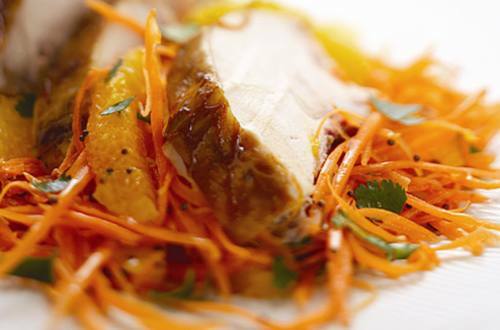 Grate the carrot and toss with orange segments, coriander leaf and the dressing. Cut the chicken into pieces and serve with the salad.